Working together to keep the Shutesville Hill Wildlife Corridor open and safe so Vermont wildlife can thrive now and into the future. A mother black bear and her cubs are making their way down to Route 100 from the Green Mountains. They’ve eased through a thread of forest and wetlands and wait by the road as cars zoom past. Finally, it is quiet. The mother crosses, the cubs follow, scrambling up a bank on the other side just before a tractor trailer crests the hill. The family continues east, staying within the cover of the woods. In the near distance, a dog barks, a car winds up a drive, a lawnmower hums. As night falls, they follow a stream to another road, amble across, and slip back into the forest heading up to the Worcester Range. 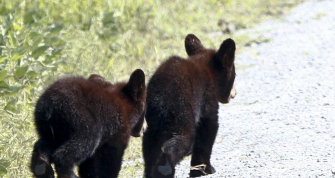 Just like generations of bear before them, they’ve journeyed safely through the protection of the Shutesville Hill Wildlife Corridor. 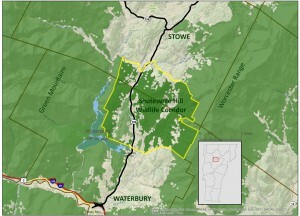 The “Shutesville Hill Wildlife Corridor” crosses Route 100 on the Waterbury-Stowe town line and is the only viable connection between the Green Mountains and Worcester Range. It is one of the five most important wildlife crossings in the state and a critical part of a international network of connected forest habitats in the northeast. Protecting this corridor ensures that wildlife will be able to move freely across Route 100 and our region to find suitable habitat over the course of a year, individual lifetimes and generations. Download the Shutesville Hill Wildlife Corridor fact sheet..
Where is the Shutesville Wildlife Corridor? 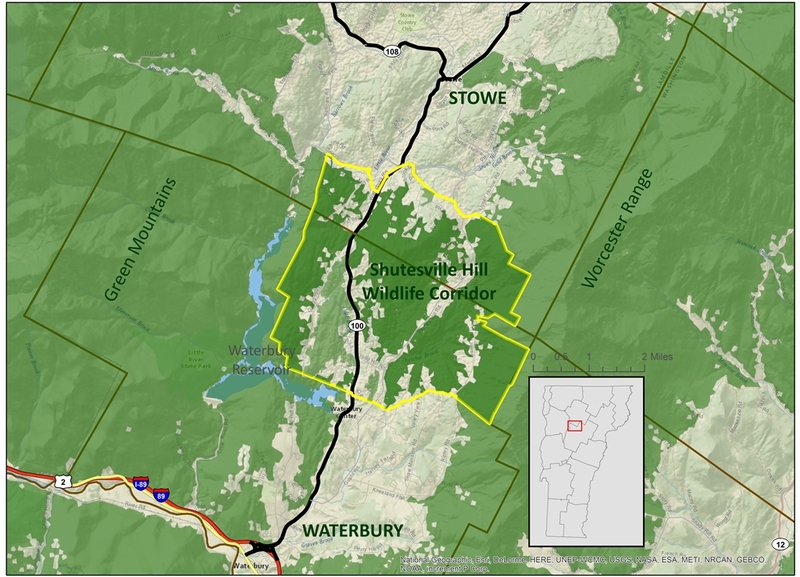 The Shutesville Hill Wildlife Corridor includes a Highest Priority Connecting Forest Block that links the Green Mountains and Worcester Range along the Stowe – Waterbury town line. Download the Shutesville Hill Wildlife Corridor Map. Fragmentation or breaking up of forest cover within the corridor due to human development such as roads, driveways and land clearing for houses and other structures. Intrusive activities associated with residential and commercial development such as domestic pets, outdoor lighting and noise. Increased traffic volumes and speeds along roadways – particularly Route 100. Barriers to wildlife movement such as fences and guardrails. Permanently conserve the most important and vulnerable parts of the corridor by working with willing landowners to apply tools such as conservation easements. Further incorporate the corridor into municipal and regional plans in order to minimize negative impacts of new development within the corridor. Share information with property owners within the corridor about its importance and what individuals can do to help keep the corridor open and safe. Make road crossings along Route 100 safer for wildlife passing through the corridor. Download the Landowner Fact Sheet. Please join us today in ensuring that wildlife can move safely through our landscape for years to come. For more information contact Bob Heiser, Vermont Land Trust, at (802) 861-6404 or bheiser@vlt.org.